Since my duo post colleague and I will be looking at this 2005 film next week, I thought to highlight an aspect some have overlooked. 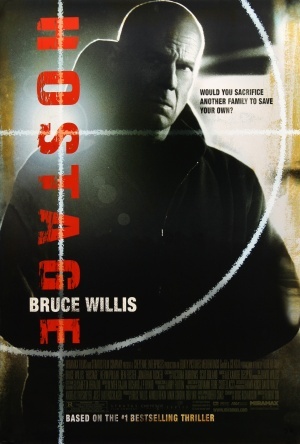 Hostage‘s quite eye-catching movie titles. I suspect the French filmmaker, Florent-Emilio Siri, encouraged the striking, video game-minded visuals for the film’s opening credits. I mean, Siri by this time had already directed two Splinter Cell game variants, Pandora Tomorrow and Chaos Theory, before he ever made his American film debut. The approach paid-off. Crafted by the same guy who collaborated with Siri on his previous film, Nid de guêpes (aka, The Nest, 2002), his fellow compatriot and motion graphic designer Laurent Brett did très bien. The Hostage titles stood out for a number of reasons. Those who regularly admire opening and closing credits will immediately spot two motifs and films influencing Brett’s work. Sin City (out that same year) and 2002’s Panic Room. The former’s high contrast and distinct color palette blended with the latter’s organic title typography floating within scene landscape. The film’s opening carried through a hunter’s perspective, seemingly stalking prey into and out of the vacant urban setting. 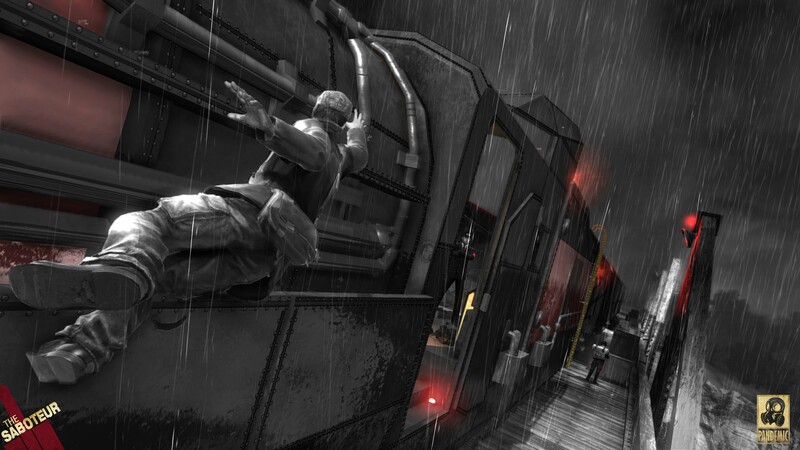 The sharp black and white imagery as the primary transport through a police-hostage backdrop, with the titles jutting out as discrete elements in the foreground. Tracking a soon to appear quarry. The color red, as usual, noticeable. Characterizing the human element in it all, or perhaps signaling a warning. An utterly graphic, camera-always-in-motion, computer generated sequence; a real stunner that pressed the inner-city viewpoint, I believe. The entirety done with an unmistakable design and flair. An homage piece, for sure, that created its own well-defined identity. Without a doubt, the movie titles helped enormously by Alexandre Desplat‘s pulsing, moody theme music amping the tone. Hmm…three Frenchmen coming together to do great work. Does that make it a ménage à trois? Okay, enough of my rotten French. Enjoy the titles. Good to hear! This needs more love. Thanks Tyson. I watched this a year or so ago. I didn’t really remember the credits (though they are pretty good from the clip above), but the film was decent. Not great, but definitely enjoyable. Looking forward to your comment on the upcoming review, Morgan. Thanks. I remember liking this movie quite a bit when I saw it in the theater. They did do a tremendous job on these titles. Don’t they? Good to hear, mummbles. Thanks. How was the book festival? For some reason I thought it was this weekend (my memory is not so good lately, yes? :) but when I looked at the site it looks like it was last weekend. I hope you had a great time! Isn’t that a terrible feeling when there are no new Robert Crais titles left? Left to wait until the new one comes out. Argh! Does NZ have a Netflix equivalent? I’d be interested to hear. And the LATFOB was great, though we missed having Bob there. Thanks, Rachel. Never seen it. Going to have a look see for sure! I think it’s worth a look, Chris. Thanks, my friend. I saw this a while back and enjoyed it. Didn’t remember the opening titles though — they are quite good. This clip reminds me a lot of the video game, The Saboteur, which similarly used black, white and red to perfection. Makes me wonder if they looked at this film for inspiration. I’d agree, Eric. Those are great screenshots, too. Good point, my friend. Thanks.